Scholastica | How do discussions work? After submitting a manuscript, authors can communicate with the journal’s editors (and vice versa) using Discussions. Discussions allow users to send emails to each other while keeping a record of all communication attached to each manuscript. 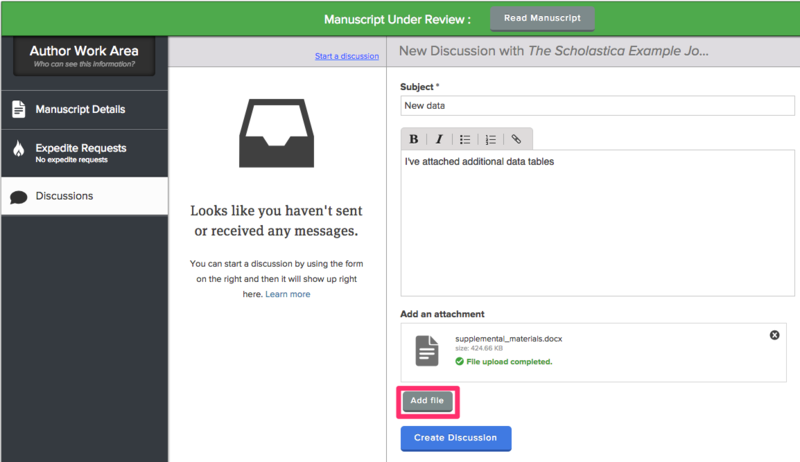 Each manuscript's page on Scholastica has a Discussions section where messages and files can be passed between authors, editors and reviewers. Discussions can be started, sent, and read on each manuscript's page, and recipients get email notifications for each message, which they can respond to in Scholastica or via their email. For both authors and reviewers, Discussions make it easy to get in touch with the journal's editors about a manuscript. Messages sent by authors and reviewers go to the journal's editorial team. Authors and reviewers cannot send messages to each other and cannot both be included in a single discussion as this would violate blindness. Reviewers should also keep in mind that reviews should be submitted using the review form, not as a discussion. Messages are always in reference to a particular manuscript and can be sent and read from that manuscript’s page. From your Dashboard click My Manuscripts, or if you’re a reviewer, My Reviews. Click the manuscript you’d like to discuss with its editor. In the Manuscript Work Area, click Discussions. Enter a subject and your message. Editors can start discussions with their fellow editors, with reviewers, or with authors. Each discussion will be marked and easily distinguished based on which type of user it includes. Messages sent by editors will include the editor's name. From your Dashboard click My Journal. Click the manuscript you’d like to discuss. In the Editor Work Area, click Discussions. Choose if the discussion will be with Editors, Reviewers or Authors. Choose who should receive email notification of the message. To save time when writing common correspondences you can use Discussion templates. 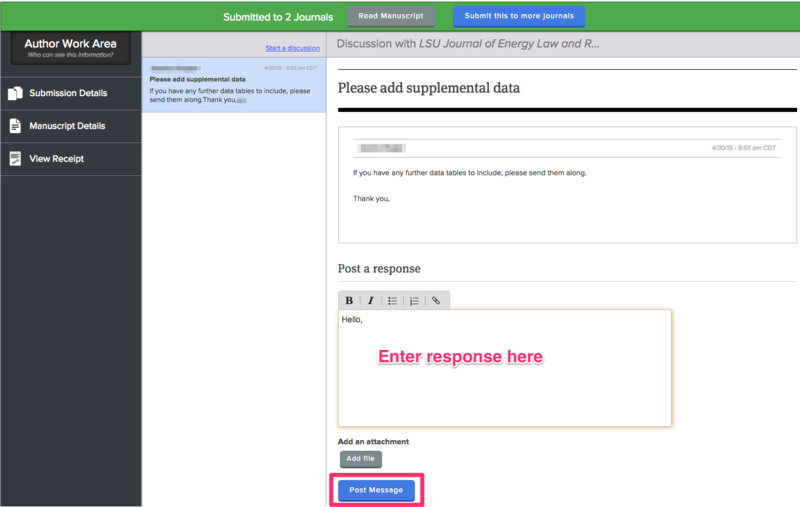 To enter a template letter for your Discussion messages, you'll just navigate to the Discussions tab for any manuscript. Once in the Discussions area, click into the text box, and click the Use a template dropdown. To edit the templates, simply click "EDIT" next to the template you'd like to change. A pop-up box will appear in which you can enter your letter and click "Save changes and close" when you're finished. Though editors can see all messages, they will only be notified of a message via email if the box next to their name is checked when the message is sent. Authors can't see reviewer messages and reviewers can't see author messages or messages with other reviewers. Editor discussions are visible to all your journal's editors. Author discussions are visible to all your journal's editors and the manuscript's primary author. Reviewer discussions are visible to all your journal's editors and the individual reviewer who you have selected to receive the message. Because law articles can be submitted to multiple journals, there are separate discussions under each journal to which you've submitted on the Submissions Details page for the manuscript. 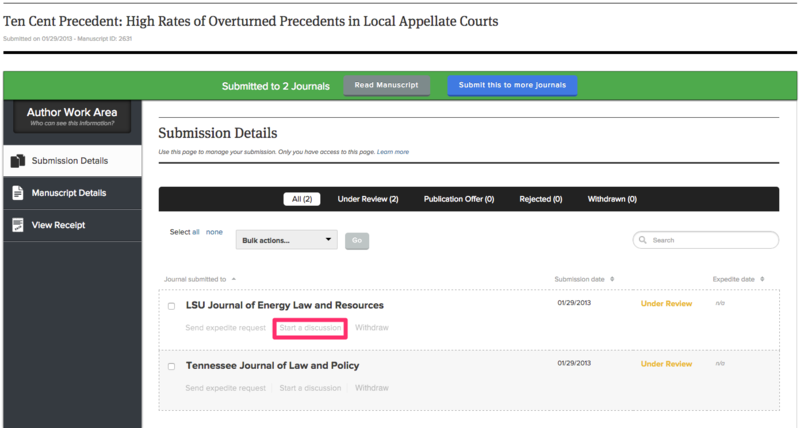 Legal authors can send messages to multiple journals at one time (without the journals seeing that you've messaged more than one), but replies only go to a single specific journal. Requests for an expedited review should be sent via the expedite request feature, not as discussions. Authors can message a single journal individually by finding the journal in the list of journals on a manuscript’s Submission Details page. Find the journal you want to message. Click Start a discussion under the journal’s name. 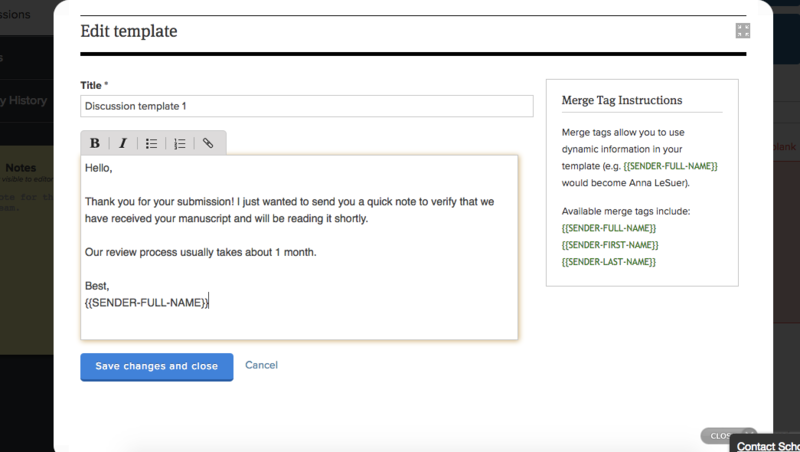 Law authors can send the same message to multiple journals on the manuscript’s Submission Details page. Check the box next to each journal you want to message. Select Start a Discussion from the Bulk Actions pull-down. When a Scholastica user receives a message, they’ll be notified by email. The message and any attached files will be contained in the email. 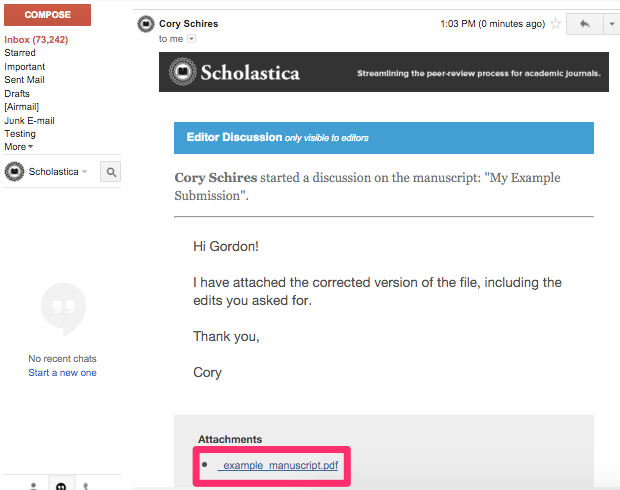 Recipients can respond to the message right there via email, or by going to the Discussions section of the manuscript’s page on Scholastica. You can easily respond to a message from within the Discussions section. Under Post a Response, enter your message. You can also respond via email to the message notifications. Enter your response like a normal email conversation. If you need to send files, you can attach them like a normal email attachment. Messages can include files like revised manuscripts or supplemental data. Add more files by clicking Add file again. When responding to a message via email, you can attach files like normal and they'll be included with the message and saved in Scholastica. Files that are attached to a message will be listed in the email notifications, but must be accessed by logging into Scholastica. Simply click the file's name and you'll be taken to the discussion in Scholastica, where you can download the file.